When I was working (nearly two decades ago) I was told that to get a satisfactory reproduction one needed to have the file at 300dpi CMYK so that the print machine could reproduce the photo accurately. I have continued to ensure that all my to be printed photos are at 300dpi (and I appreciate that modern printers use RGB) and have my camera set at this resolution. In this day and age of phone cameras I have noticed that people are getting very acceptable prints at large sizes by simply taking their phones to a quick print shop and having them printed to whichever size they want. My phone takes very large pictures at 72dpi which I convert to 300 dpi via the Image>Resize tab (ensuring that the pixel size remains the same as the original). Then cropping to the size of my intended print. I can do this easily as I have Elements 15 but my friends don't have this luxury and their prints are fine. Am I just old-fashioned and wasting my time? 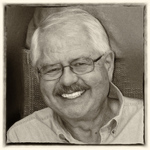 Do modern printing systems no longer require high resolution originals? I'm not talking professional photography here - just 'happy snaps'. 240 works well for prints. A pro togger, Photoshopper and printer told me this years ago. 300 is the old accepted standard (which I often still use) but she said there was no diff between 240 and 300. I am sure this will spark discussion. The only thing that matters is the actual size of an image in pixels, not pixels per inch. For example, the size of an image from my phone is 3024x4032 pixels. If I make a 4"x6" print, there are 756x672 pixels per inch. If I make a 8"x10" print, there are 378x403 pixels per inch. If I make a 20"x30" print, there are 151x134 pixels per inch. You didn't say what size prints you intend to make, but for an 8x10 inch print, you will get photo quality if your source image is 1680x2240 pixels or larger. The first thing we need to do is clarify the definition of PPI and DPI. They are not the same thing as many people seem to think they are. PPI = Pixels Per Inch and is used solely to size an image for printing as I will discuss later. It has no meaning at all for screen display. I can have a 4000px x 3000px image set to 72 ppi, 300ppi, 450ppi or just about any ppi I like at it will still be a 4000px x 3000px image. DPI = Dots Per Inch and is the number of dots of ink per inch any printer will use to reproduce the rgb colours in an image. 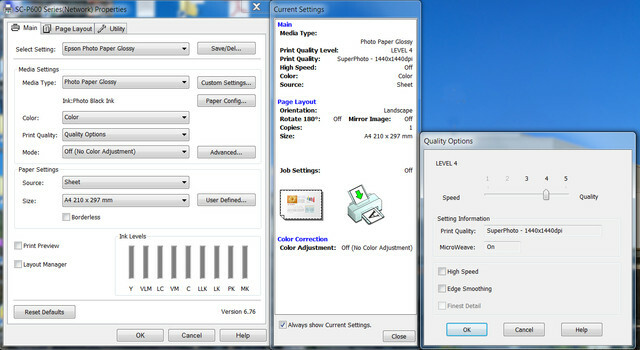 To keep things simple we can assume for this post that all the image's colours are within the printer's colour gamut. Generally, they will not be. You can see in the image on the right (Quality Options panel) that my home printer is currently set to 1440dpi x 1440dpi print resolution, regardless of what the ppi is of any image I print. 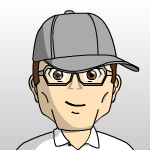 To answer your query - Every printer will have its own native printer resolution (PPI). Generally, for Canon printers it is 300ppi, Epson printers are 360ppi. I would assume all other printers are also around 300ppi. When you send a print to any printer, whether it is a basic home printer or a multi thousand dollar lab printer they will all resample your image to its native printer resolution and then convert the rgb data to DPI to determine how many dots of each coloured ink it needs to reproduce the rgb colours. 1. Make a 100% crop of the image in the aspect ratio of the paper size I will be printing to. 3. I ensure the "Resample Image" checkbox is unticked. This is a must do. I don't want to resample the image. 4. 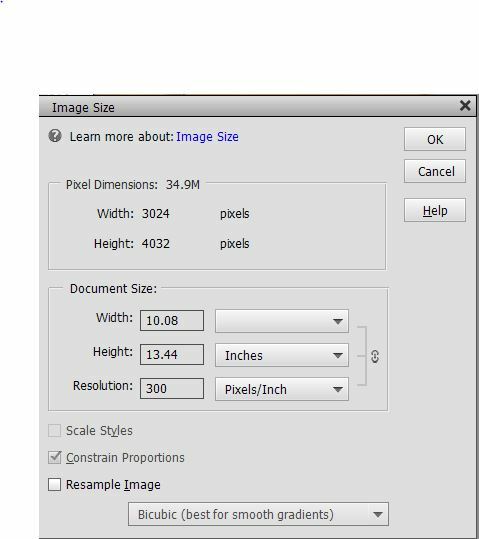 I enter the value of the Width or Height of the photo paper in the Document Size panel. The image's PPI is then automatically recalculated in the "Resolution" box. 5. As long as the PSE calculated PPI resolution is around the printer's native resolution then you have enough pixels in your image to potentially make a good quality print. If the calculated PPI is below 220ppi (from memory) PSE will display a warning that the image's print resolution is too low for the set paper size. But it will still let you go ahead and print it if you like. So the bottom line to remember here is that all printers will resample (downsize or upsize) an image to their native print resolution before printing commences. This is all handled by the printer driver. Personally, I am very happy with the results when I let the printer driver resample an image to my printer's native resolution. The other alternative is to manually resample your image to your printer's native resolution and then send it to the printer. This boils down to personal choice based on your experience with your printer. Let's assume a printer's native resolution is 300PPI and you want to make a 6" x 4" print. You will need an image at least close to 1800px x 1200px in size. If the image is only say 300px x 200px (50ppi for 6" x 4" paper) then the quality of print will be noticeably lower than the 1800px x 1200px image. While I agree that old school DPI and digital age PPI are horses from entirely different barns, so far as scanners, home printers, the kiosks at the big box stores, and computer image handling programs are concerned, they are treated as being two ways of saying the same thing. Regardless of which of our scanners I use, when I scan something at 1200 DPI, it reads as and is treated as 1200 PPI in any and all of our photo programs. That is all that matters to me and the tools I have to work with. 240 works well for prints. 300 is the old accepted standard (which I often still use) but she said there was no diff between 240 and 300. If I have enough resolution for the size of print, I will go with 300-ppi; however, if I have to back off to 280- or 240-ppi, to my eye I can't see any difference. I read somewhere that, depending on the image, you can get away with 180-ppi on poster-sized prints. I do know one thing for certain; ten years ago, my wife's sister was working at the local newspaper office; she took a cell-phone photo and made a poster-print of it that looks professional. My phone takes very large pictures at 72dpi which I convert to 300 dpi via the Image>Resize tab (ensuring that the pixel size remains the same as the original). Then cropping to the size of my intended print. If you are doing a 100% crop then the PPI of the crop will be lower than 300ppi because of the reduced size of the image in pixel length and width. If you are resampling at the same time as cropping then the ppi will remain at 300ppi. Hopefully my first post in this thread shows why it might be preferable to first crop, without resampling, to the aspect ratio of your paper size and then check if the ppi is still sufficient. I'm not sure how this relates to the op's query. All you are saying here is that if you scan a sheet of 8" x 10" paper with 1200ppi set on your scanner, the outputted document will be 9600px a 12000px. With these pixel dimensions you could make a good quality print up to around 32" x 40" (9600/300 x 12000/300). If you intend to only print the scanned document on another 8 x 10 sheet of paper, then the original 1200ppi scanner setting is way overkill, since for 8" x 10" you need only 2400px x 3000px. If you want to make a print larger in size than the original scanned sheet of paper, then you should scan at an appropriately higher ppi. For example, say your original document/photo to scan is 6" x 4" and you want to eventually make a 12" x 8" print after scanning. You will need a scanned output of 3600px x 2400px (12" x 8" at 300ppi). In this case I would set the scanner resolution to 600ppi so that the output of the scanned 6" x 4" will be 3600px x 2400px. Maybe.......depending on the poster's content and how far back you stand when looking at it. The giant billboards you see on top of buildings, or wherever, will be much, much less than 180ppi, even less than 100ppi in many cases. Viewing these from afar, they will look very clear and sharp. But if you can get to within 1-2 metres of them, each pixel will be huge comparatively and the image on the billboard will be unclear when standing that close. ChrisAnn - Everyone has made some good points. The question is, "Are you happy with your prints?" If so, then your done. Frame it, Hang it, and enjoy. Yes that is one way of looking at it and many people do. I guess it depends to some extent on when we are happy with knowing enough and no longer have a desire to learn more or to improve even further. With photography, and that includes outputting images as prints, we could never stop learning if we wanted to. When I first started out with printing I was also "happy" with my prints........eventually......after many times tweaking images to get them looking how I expected from my lab printer. I could have just stuck with that but I wanted to know and learn why I had to often tweak images before they looked correct after printing. That's when I got very interested in colour management from image capture to final printer output. Now I am even "more happy" with my software and hardware setup here at home for my image workflow. Colour management is way more than what ChrisAnn is querying about here but it is very related to printing nonetheless. Phew! I was anticipating a simple yes or no answer . However, I'm going to save all the answers you've so kindly given me; carefully read everything and try my best to make sense of what is being said. The older I get the slower my brain is to take in new information (retaining the new information is also a problem - hence saving and quite likely printing out this thread). Most of the photos I print are just 6 x 4 in size so that I can keep them as a record or hand them on to friends. Other than that I catalogue all my pictures using the Organizer and can view them on the screen when I want to browse. Thank you all so much for taking the time to explain to me how this ppi/dpi thing works. I am old enough to remember my parents buying a roll of film for use when we went on holiday and then anticipating seeing the results of their efforts after we returned home. They would be astounded at how far things have progressed in such a comparatively short period of time. I can remember when professional photographers wouldn't touch a digital camera as the resolution wasn't up to their standards and it doesn't seem all that long ago either. Phew! I was anticipating a simple yes or no answer. Since most of your prints are 6" x 4" I wouldn't get too bogged down in image size for printing. The main thing to remember is that all printers resample the image to their own native printer resolution anyway - typically ~300ppi - regardless of the image's actual size. For relatively small sized prints, as in your case 6" x 4", you normally wouldn't notice any difference in print quality if your actual image size was 1200px x 800px (200ppi) or 1800px a 1200px (300ppi). On much larger print sizes you might see some loss in print quality between 200ppi and 300ppi images due to the resampling. As long as your image is around 1800px x 1200px for 6x4 prints any loss of print quality due to the printer resampling the image to its native printer resolution will be minimal because only a relatively small number of pixels will be added or removed due to the resampling. I'm sorry to see this thread escalated beyond your question so quickly. but that today's image capture devices provide very high resolution originals, so you don't need to be concerned about it if you are making 4"x6" prints. As I said before, all that matters is the actual size of your image in pixels. For example, if your image is 400x600 pixels, then a 4"x6" print will have 100 pixels-per-inch. If you want a 4"x6" print that has 300 ppi, the original will need to be at least 1200x1800 pixels. If you do this experiment in Elements you will see what I mean. Load an image, then go to Image | Resize | Image Size... as you have been doing. 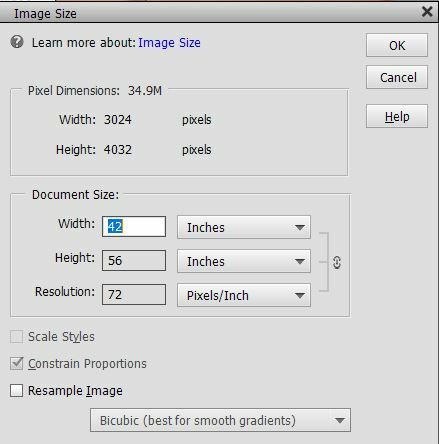 Under Pixel Dimensions you will see the actual size of your image. At the bottom, uncheck Resample Image (this insures that your image will not be altered). Now change any of the three boxes in the middle, under Document Size; you will see the other two boxes change in a proportional manner. 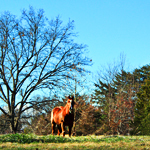 The first example below is telling me that IF I print this image as a 42"x56" image it will have a resolution of 72 ppi. In the middle example I changed the Resolution to 300 ppi, so the print size would be 10.08"x13.44" at that resolution. In the last example I changed to width to 8", so the height comes out to be 10.667" and the resolution comes out to 378 ppi. If you check Resample Image, then your image will be actually altered if you change any of the three parameters. In this case you are asking Elements to remove pixels to make it smaller, or invent new pixels to make it larger. I really hope this has been helpful Chrisann. "As I said before, all that matters is the actual size of your image in pixels." is simply not true when it comes to printing. Your statement implies that a 400px x 600px image can be printed on any sized paper and produce a good quality print which obviously isn't true. What you describe in your post is how to size images for printing which is similar to what I posted earlier but it's not correct to then also say that ppi doesn't matter and that only pixel count does. The only purpose of PPI resolution is for sizing images for printing. It has no meaning or use for screen display. If you print a 400px x 600px on a 6" x 4" paper, the printer will resample the image to its native print resolution anyway. Let's assume a native resolution of 300ppi. Then the image will be resampled to 1800px x 1200px before printing. The result is that 1.92 million pixels will have been added to the original 240,000px. Surely you're not suggesting that it is impossible for every 400 x 600 pixel image to loose image quality when resampled to such an extent ?? To help maximise print quality it is always best to have your original image close to the printer's native resolution, especially if the ppi for the paper size you choose is less than the printer's native resolution. If this statement was true then you are saying that printing a 200px x 160px image on a sheet 10" x 8" (20 ppi) will always produce a good quality print which is not true. I suspect the 300ppi "rule of thumb" requirement for good quality prints comes from the fact that most printers' native resolution is ~300 ppi. So it is clear, to me at least, that sufficient pixels per inch is a "must have" to produce a good quality print.